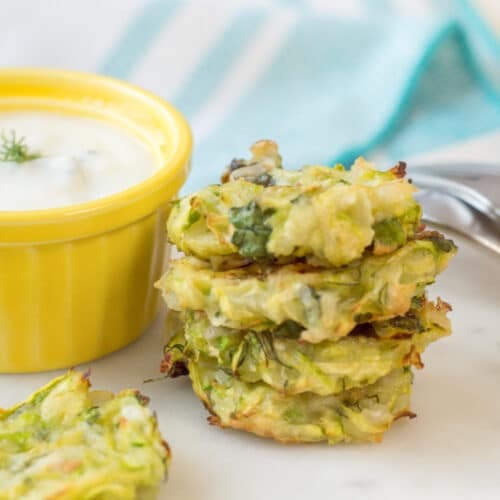 These easy vegan zucchini fritters are baked rather than fried for a healthy (but still totally delicious) dish. Paired with a creamy, dairy-free yogurt sauce these little morsels are totally irresistible! Line a baking sheet with parchment paper and spray lightly with olive oil cooking spray. Place the shredded zucchini in a colander and toss with 1 tsp salt. Let this sit for 10-15 minutes – this will help draw the moisture out of the zucchini, so the fritters are not soggy. After allowing the zucchini to sit for 10-15 minutes, use your hands to gently squeeze as much moisture out of the zucchini as possible. In a large mixing bowl, combine the zucchini, onion, olive oil, water, baking powder, flour, dill, parsley, and black pepper. Stir to form a batter. Scoop a large spoonful of the mixture, and use your hands to roll into a ball. Place on the baking sheet and press down gently to flatten slightly into a patty shape. Repeat the process until you’ve used all the batter. Lightly spray the tops of the fritters with olive oil spray. Bake for 15 minutes, or until golden brown, flipping them over halfway. Whisk the zest and juice from one lemon, dill, and parsley into the dairy-free plain yogurt.